In an interview he gave Jewellerynet.com, Ezra Boaron, chairman of the 2019 International Diamond Week in Israel (IDWI), spoke about next year’s edition of IDWI (January 28-30) and prospects in the diamond trade in 2019. Boaron said that the IDWI will see close to 200 Israeli diamond companies offering “a huge variety of diamonds of every size, colour and shape”. Boaron mentioned that the Israel Diamond Exchange (IDE) will be offering free hotel accommodations for three nights to eligible buyers and the format – a boutique show, with minimal costs, specially geared to diamond buyers – “has been a great success and has attracted hundreds of buyers from over 30 countries”. 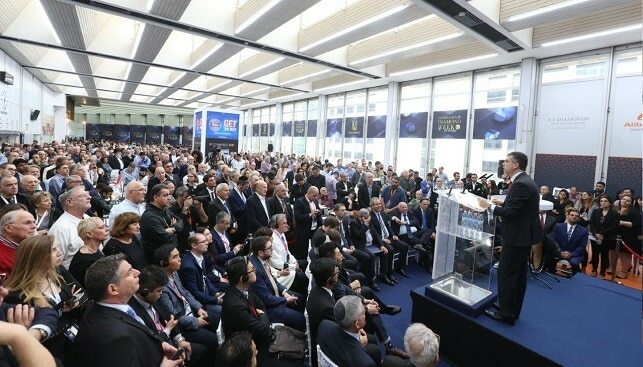 Boaron added that for the first time ever, the 2019 IDWI will feature TED-like talks “by world-class experts who will share their knowledge and experience in areas of interest to the diamond industry” held right on the trading floor. Another new feature is a section of high-end jewellery, offered by members of the IDE. Asked whether he believes robust buying activity at next year’s show, Boaron replied that “2019 will be starting off very well after an excellent holiday season in the US and Europe”, and so the IDE expects “that the next IDWI will feature robust buying”. He added: “An important growth driver for IDWI is a shortage in certain goods in the market, and the need to replenish stock after a strong holiday season […]”. He added that the kind of goods for which strong demand is expected, based on the last IDWI, are 1 carat to 3 carat stones, “eye-clean diamonds” and “special and very expensive stones, with record-breaking demand at auctions of large diamonds”. When asked about his views on the current state of the global diamond trade, Boaron said that as the American market – Israel’s largest market – “is doing very well and is showing significant growth”, the effect on Israel’s diamond industry is a good one. He said that the Asian market is showing “some growth” and the market is seeing positive demand for certain goods, “although interest is very sensitive to price”. As for India, Boaron said there there is a “change for the worse […] where the banks are cutting credit to diamond companies” and added: “We hope that this will not affect the diamond industry as a whole and that 2019 will be a better year than 2018”.